In 2012, the average American consumed 13.6 hours of media each day. By 2015, that number is expected to rise to 15.5. These figures include media multitasking, e.g., listening to music while checking your email, so that it's possible to consume more than one hour of media within a 60-minute period. Shockingly, those 13.6 hours don't include any media consumed at work. This post is republished from The Art of Manliness in partnership with Federated Media and smartwater. Basically, most of us are daily consuming a torrent of media equivalent to the number of our waking hours. If we're up, we're plugged in. We consume this endless stream of media through the TV and the radio, and increasingly via our computers, smartphones, and tablets. These squares of metal and wire have become our constant companions, so that we never have to let a spare moment go by without something to distract us. Imagine watching a film recording of a day in your life — how much of the footage would show you staring at a screen? It's pretty disconcerting when you think about it. Technology has brought us a world of benefits, but it has its downsides too. It can distract from our productivity, create a stress-inducing expectation to always be on-duty for work, and instigate feelings of FOMO. It also creates a bad case of dependency. When a study was done with college students that asked them to abstain from consuming any media for 24 hours and then write about the experience, many described their attachment to their phones and computers as an addiction, and recorded that going without their devices made them feel restless, bored, anxious, lonely, and isolated. Many missed their music and found it hard to focus without it; the quiet was deafening. How would you do with unplugging from your tech for 24 hours? Why not find out? And why not make it not just a one-time experiment, but a new weekly ritual? And God Said, "Turn Off Your Phone"
In 2003, a small group of Jewish artists, writers, filmmakers, and media professionals wanted to find a way to slow down in an increasingly hectic world. They developed The Sabbath Manifesto, a creative project designed to encourage people to take a weekly day of rest from their technology. 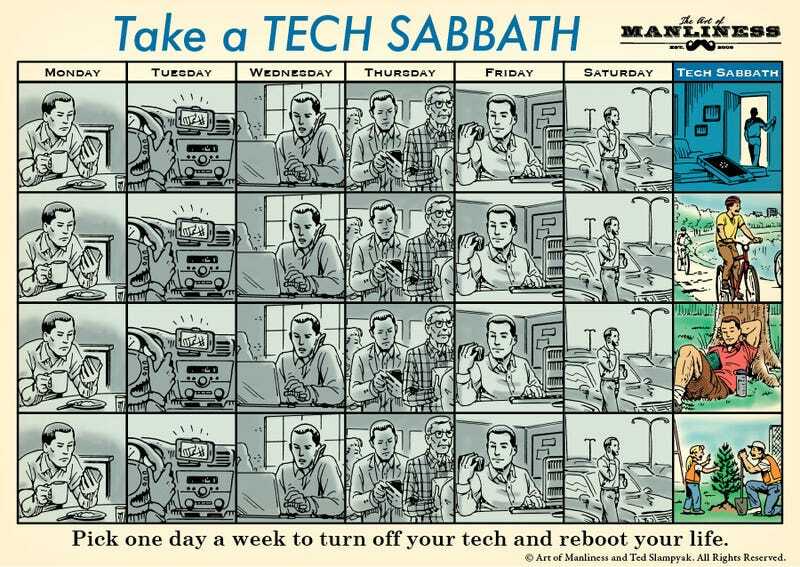 The idea of a Tech Sabbath comes from the ancient, religious one; in the Old Testament, God rests after spending six days creating the world, and then commands his people to do likewise: "six days thou shalt work, but on the seventh day thou shalt rest: in plowing time and in harvest thou shalt rest." These days, especially because technology has allowed us to be "open 24/7," many of us never completely rest from our professional work on any day of the week. And even if we manage to put all work aside on the weekend, we're still plugged into the same gadgets we've been using nonstop Monday through Friday. Our lives are Groundhog Day-esque: we wake up, plop down in front of a screen, and go to bed. Rinse, wash, and repeat. Taking a weekly Tech Sabbath allows us to step off this wheel of endless sameness. It's a ritual that pushes us out of the norm, to pursue different activities, and use different parts of our brains. In so doing, it refreshes and rejuvenates our minds and spirit. It provides the motivation to unhook our wired craniums from the matrix of cyberspace and explore the pleasures of the real world. The book of Genesis says that when God finished his work on the sixth day of creation, he took time to look around at what he had made and appreciate its splendid goodness. Only then did he resume the creative process. So too, when we take a Tech Sabbath, we cease from creating and simply spend time enjoying and appreciating the magnificent things around us — whether our own creations — our friendships, our children, a hearty loaf of bread we baked ourselves; the creations of mankind – art, wine, books; or the natural creations that wait outside our door. It's also a chance to realize our appreciation for the tech from which we are resting; a Tech Sabbath can serve as a reminder that what can feel like a burden, is truly an amazing tool. As we re-connect with the people, places, and things we can touch, smell, and really soak in, we become rejuvenated to begin creating once more as another week begins. While the founders of the Sabbath Manifesto are Jewish, they invite folks of all backgrounds to participate in taking a weekly "tech fast." It's an idea that transcends religious belief, and one that's beneficial to all. It may be an aspect you add to your current religious Sabbath, or a ritual you begin on its own. If you think a Tech Sabbath might be something you'd like to try, here are a few tips on making it a successful habit. Kick things off with a whole "Input Deprivation Week." If you feel particularity attached to your devices, and that this tech "addiction" is really impeding your life, consider first doing a whole "Input Deprivation Week," as outlined in yesterday's post about taking action. Once your 7-day media fast is complete, use a weekly Tech Sabbath as your maintenance plan for keeping your relationship with technology in balance. Choose the timeframe and day that's right for you. The Jewish Sabbath runs for roughly 24 hours, from around sundown on Friday to the arrival of darkness on Saturday evening. This timeframe can work well for a Tech Sabbath as it comes at the end of the week, when you may be aching to close your laptop and detach yourself from the digital tentacles that have been wrapping themselves around you. It also gives you a chance to check your phone/email on Saturday night, so you don't feel like you're out of the loop for a full day (as you would if your Sabbath ran from, say, the time you got up on Saturday to when you got up Sunday morning). The downside of a Saturday Sabbath is that it's often a day for running errands and going out with friends — activities that typically require computers and phones for looking up locations online and making social plans. Sunday, then, may work best, as it's often more of an easy-going day. Just pick a day and timeframe that works best with your schedule and psychological needs. Choose the level of tech abstention you're comfortable with. A Tech Sabbath doesn't have to mean exactly the same thing for everybody. Maybe you want to go whole hog and even eschew your microwave. Maybe you do still use your phone, but only for calling your grown-up kids to catch up with them. Abstain from tech in a way you personally feel will be the most rejuvenating for you. Plan ahead. I've taken non-intentional Tech Sabbaths when I've gone camping, and I found it easy to leave my tech behind and not even check my phone, which I'll bring for safety's sake. So I figured I wouldn't have any trouble doing one at home on a regular day of the week. I was wrong. First, as mentioned above, you'll be surprised how often you need to look up information on the internet. You realize you threw away the yellow pages and don't know how to get somewhere or what a business' hours are. And if you're going to hang out with other people, you won't have any way of coordinating when and where you'll meet up (if you've decided not to use your phone at all). So try to think of any details you'll need to know the day before and cement your plans if you can. This can still be difficult, which is why it's ideal to spend your Tech Sabbath doing things that are relaxing and rejuvenating and don't necessarily involve driving around town and lining up your schedule with other people. The Sabbath Manifesto wisely advises against participating in any commerce, as taking a break from anything business-related – even if you're not the one working – offers the fullest rest from your usual routine. Know what you'll do. The second thing I found challenging about doing an at-home Tech Sabbath was that the computer was right there, beckoning me. During your Tech Sabbath, you're going to have an itch to look at your devices, so it's best to have a plan for constructive activities to pursue. The writers of the Sabbath Manifesto recommend doing things like connecting with loved ones, meditating, making a home cooked meal, and doing community service. Other possible Tech Sabbath activities include writing real letters, playing board games with your family, taking walks, and pursuing a new hobby. Even better is if these activities involve leaving the house – and the temptation to check your gadgets – behind. Try taking a bike ride, having a picnic, or reading a book at the park, etc. Combine a Tech Sabbath with spending time in nature when possible. Spending time in nature has been proven to work wonders for your cognitive power and mood. So combining the refreshing power of a tech fast with the restoring effects of nature gives you a double whammy of rejuvenation. Make time for silence. One thing you should always plan on doing during a Tech Sabbath is . . . nothing at all. How seldom in our day-to-day lives do we make time just to daydream or think? Even if our mind-wandering sessions venture into painful territory (as they are wont to do) that's quite alright. Spend time sorting through the tangles of your mind, wherever they lead. As Louis CK so astutely puts it, "You need to build an ability to just be yourself and not be doing something. That's what the phones are taking away, is the ability to just sit there. That's being a person." If you never let yourself feel completely sad because you're always pushing that empty feeling away by looking at your phone, says CK, you'll never feel completely happy either. The Tech Sabbath is your chance to exit this limbo state, where we're constantly distracting ourselves from our feelings by endlessly surfing from one page to another. It's a chance to just be present in the moment.